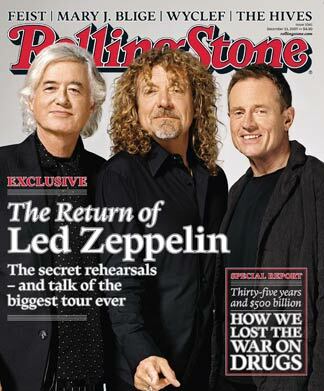 Hey look Led Zeppelin’s on the cover of the new Rolling Stone. Where’s Sean “P.Diddy” Combs? I thought he was a member of this band. I can’t wait to pick up a new Zep shirt at hot topic in the classic rock section. Sweet. Anyone else think Jimmy Page looks like one of the futuristics dudes from the original Superman movie? Kind of creepy. What’s wrong with this band? Last year they released some lame Christmas song that didn’t make any sense. This year they’ve released another lame Christmas song that doesn’t make any sense with an even lamer video. I can’t figure these guys out. They’re so pompous and full of s**t that they demand you take them seriously, but how can you when they release crap like this. Yuck! She will be mine. Oh yes she will be mine. For real though she’s so hot that I had to post another pic. If you’re being interviewed on the news these days it’s probably not because they think you’re an expert on murders or tornadoes. Stay away from news cameras. If you’ve got any leprechaun issues in your town, please contact the experts in Mobile, AL to help you out. They can solve all your leprechaun needs or problems. I know this video is old, but it’s too good not watch every once in a while. If there was a best of youtube, this would be top 10. What’s not funny about this video?